How does the errata introduced on January 17, 2019 change how Biomatrix Backup works? Prior to the most recent errata, the word “may” in the default card text meant that a decision needed to be made regarding whether the creature was placed in its owner’s archives. Since a foundational rule of the game is that the active player makes all decisions, this wording was problematic if the creature was destroyed during the opponent’s turn . As an example, if the creature with Biomatrix Backup was destroyed during their opponent’s turn, the opponent (who would be the active player at the time) could simply decide to put the creature in its owner’s discard pile – rather than its owner’s archive – thus negating the card’s intent. 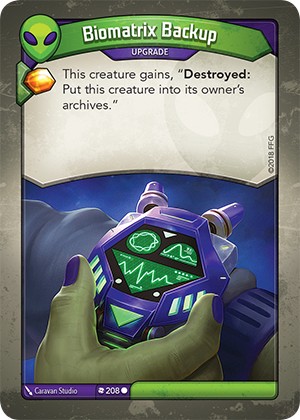 The most recent errata has changed the text to read “This creature gains, “Destroyed: Put this creature into its owner’s archives.” By removing the decision point – the word “may” – this makes it clear that the creature will always be placed in its owner’s archive, thus increasing the usefulness of the card. What happens if Biomatrix Backup is attached to a creature with a “Destroyed:” ability such as Bad Penny (“Destroyed: Return Bad Penny to your hand”)? If a creature has multiple “Destroyed:” abilities, the active player decides the order in which they are resolved. If Bad Penny’s ability returns it to its owner’s hand first, Biomatrix Backup can no longer archive the creature.